Welcome to the homepage of the Paleomagnetic Research Group at the University of Rochester. The photo shows students waiting for their ride to the next camp site during one of our laboratory's expeditions to the Arctic. Learn more about our adventures above the Arctic Circle, and our studies in the Pacific, southern Africa, and Australia. The Paleomagnetic Research Group has also been involved in the Ocean Drilling Program. In 1999, Prof. John Tarduno and then graduate student Rory Cottrell proposed an ocean drilling leg to study the motion of the Hawaiian hotspot during formation of the Emperor Seamounts as a follow-up to their paper in Earth and Planetary Science Letters. Click here for a look at life on board the JOIDES Resolution and here for a link to the Science manuscript describing results of the cruise. This work has also been highlighted in a recent article by Prof. John Tarduno in Scientific American and received recognition with the 2014 Outstanding Publication Award from the Geological Society of America Geology and Tectonics Division. In 2016, Prof. Tarduno was recognized by the Royal Astronomical Society with the Price Medal for investigations of outstanding merit in solid-earth geophysics, oceanography or planetary sciences for his work on the motion of hotspots. The Paleomagnetic Research Group has also published a number of papers on their technique in single crystal paleointensity. 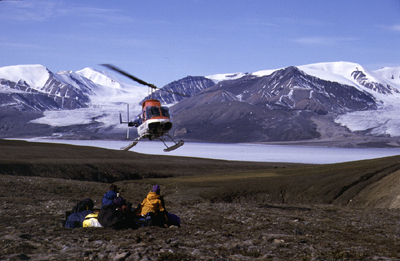 Prof. Tarduno was asked to present his group's work as part of the Bullard Lecture Series during the Fall 2004 Meeting of the American Geophysical Union which has led to a publication in Reviews of Geophysics in 2006. The Group has also had recent publications in Journal of Geophysical Research investigating the dipole strength and variation of the reversing and nonreversing geodynamo based on paleointensity measurements of plagioclase crystals. In 2007, we published the first of several papers concerning Archean geomagnetic field. In 2010, we pushed back this date further, reporting in the journal Science results from rocks 3.4 to 3.45 billion years old. This report has generated media attention around the world. In the summer of 2015, we published the first paleointensity results as recorded in zircons of the Jack Hills of Western Australia, pushing back our knowledge of Earth's early magnetic field by 750 million years.